Trout Hollow has been abandoned three different times and today is a ghost town. I was on a grand tour that took me from Toronto to Orillia, over to Meaford and then back to Toronto. Down time was needed in Meaford and so one of my brothers and I set off to further explore some of the Georgian Triangle Area (GTA). After having visited Sixteen Hollow on Saturday and now finding myself in Trout Hollow I decided I had better complete a trilogy and visit Hermit Hollow while I have a week’s hollowdays from work. We parked on 13 sideroad off of the 7th line a little south west of Meaford. The area we accessed as we went down the old road allowance is known as Trout Hollow. 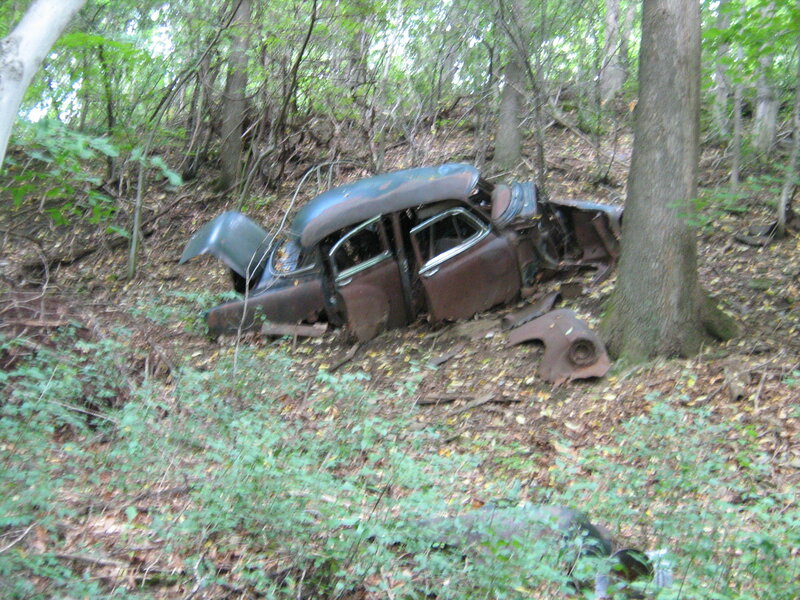 Following the yellow side trail where it goes to the right off of the road allowance brings you past one of many 1940’s era cars that have been pushed down the hillside prior to the growth of the current forest cover. Rainbow trout run in the Bighead River and there are often anglers in the hollow trying to catch a fish. However, as we shall see, that is not the reason for the name of Trout Hollow. In June of 1855 William Trout Sr. bought 200 acres of land on the Bighead River where there were good trees and plenty of water power for a saw mill. Things were a little fishy from the beginning in that mill and property was secretly deeded to the Trout boys from the beginning. William hinted that he would leave the mill to them so that his children would take good care in helping him build and operate it. Work was slowed when the Trout men were called away to contribute their millwright skills at a mill being raised near Inglis Falls. The raceway, head protecting dam and flume were completed and the winter of 1856 was used to prepare the log crib that when filled with gravel would dam the creek. A log house was constructed in 1855 for the use of the mill workers. Wood was plentiful and there were settlers coming into Meaford making the Trout mill quite profitable. In 1861 the census shows William H. Trout (Jr.) had an inventory of 66,000 board feet of lumber. A slight recession following the end of the Crimean War led the Trout family to convert their saw mill into a handle factory which they automated with the help of John Muir. John had previously invented an alarm clock bed that dumped the occupant at the prescribed hour. The Trout Handle Factory produced handles for rakes, brooms and yokes. A fire in February 1866 destroyed the buildings and all the inventory. Trout saw mill was finished and the site abandoned. For a brief period in the 1870’s The Pleasant Valley Grist Mill operated on this site but it soon closed and Trout Hollow lay silent for 25 years. 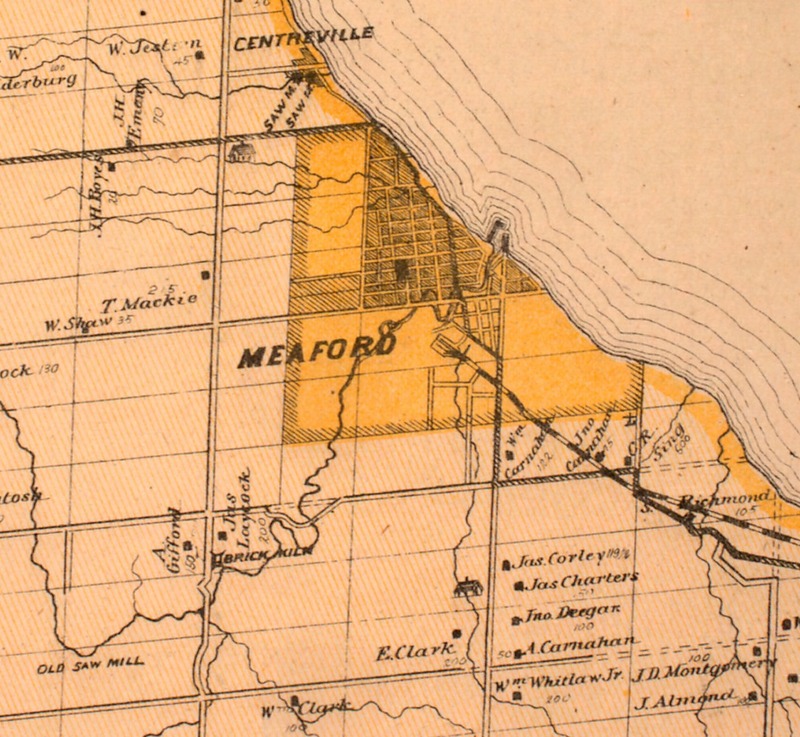 The Bighead River can be seen winding it’s way into the town of Meaford from the lower left corner of the shaded area in the 1877 County Atlas map below. Tracing it back you come to the right of way for the 12/13 side road where it takes a detour down the side of the ravine to improve the angle and make it less dangerous. The modified road allowance is seen crossing the river in Trout Hollow which has vanished by this point and is not noted on the map. In 1858 this road accessed only the mill in Trout Hollow and did not cross the river. There was a public uproar when it was decided to use government funds to repair the wood braced roadway down the hill side with stone. In 1904 an electrical power generation plant was built that resulted in the concrete dam across the river than can be seen in the picture below. 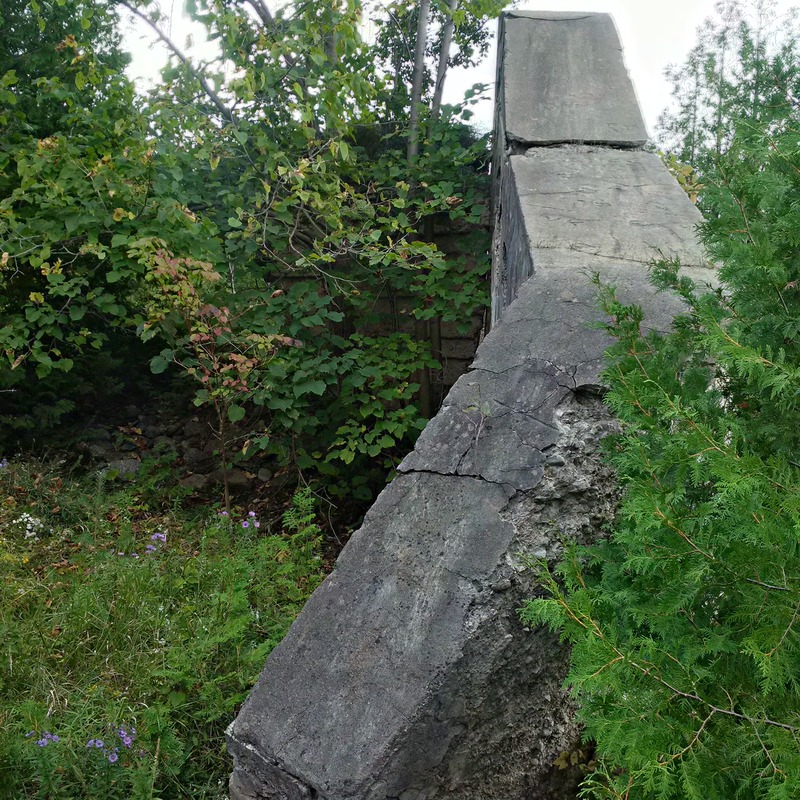 The story of the power plant can be read in the Georgian Bay Milling and Power Company post. Today the two abutments remain with the smaller one being in the distance but actually on this side of the river. The dam on the far side has lost the protective embankment to erosion and is leaning into the river. The dam was damaged in a storm in 1912 but was repaired and used until the power company closed in 1923. The crank wheels that raised and lowered the sluice gates have been ripped off of the left anchor and now dangles toward the river. The block of concrete that holds the remaining anchor is sliding toward the river and will likely soon topple in. The cover photo shows a look up the sluice gates and shows the extent of the collapse. The abutments on this side of the river are little more than a short wall of concrete. 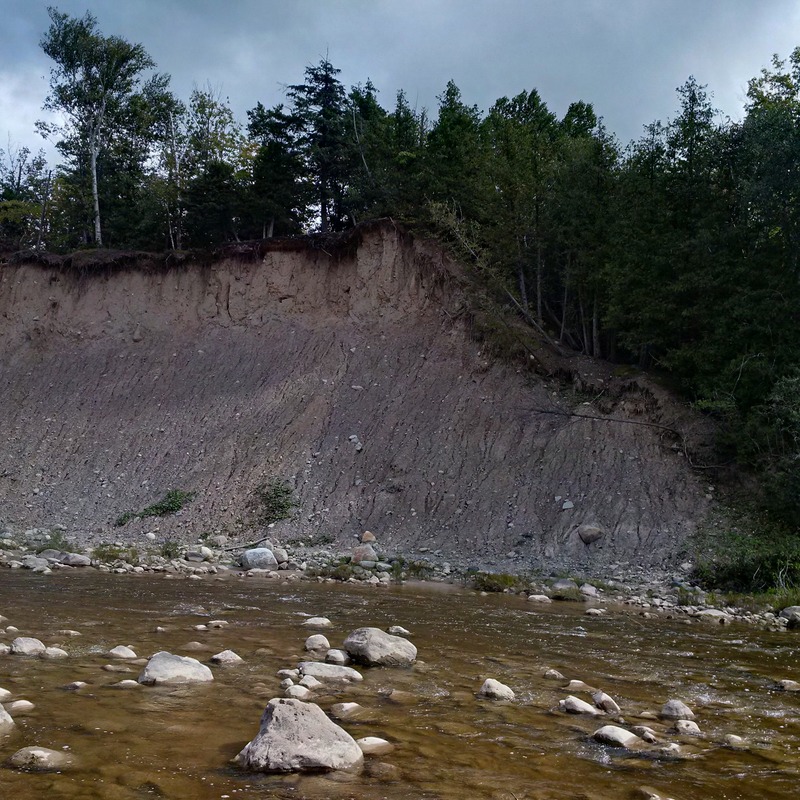 This high bank of Algonquin Beach Gravel is in constant erosion. Where it once provided the upstream berm for the power dam it now has crept back to the point where it allows the river to run behind the dam during flood time. This is accelerating the deterioration of the old dam and sluice gates. Along the berm that forms the wall of Trout Lake is a second set of sluice gates. 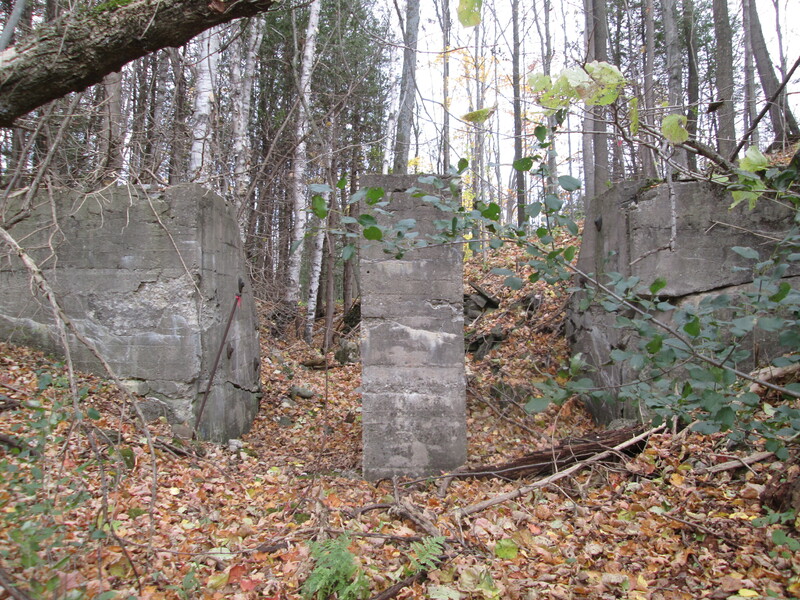 These gates controlled the water in a narrow finger lake that fed the Georgian Bay Milling and Power Company. 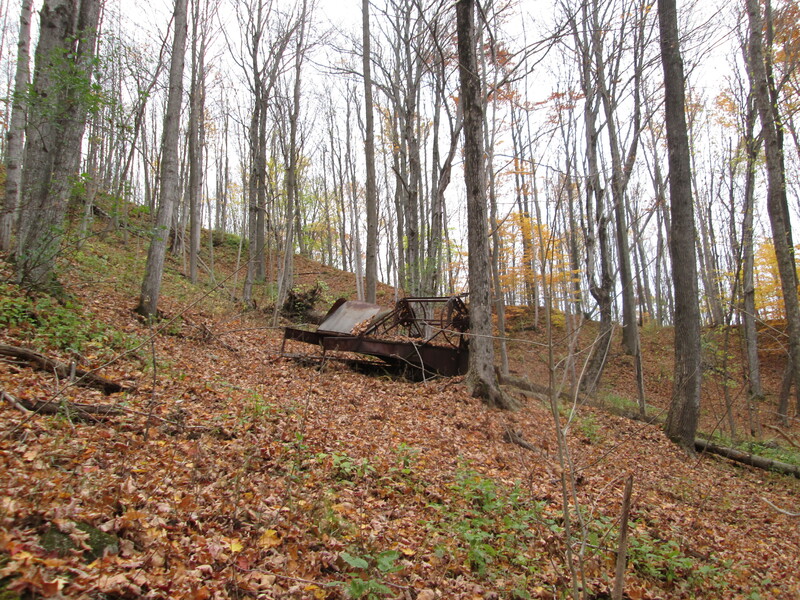 The picture used below was taken in October 2014 during that exploration. 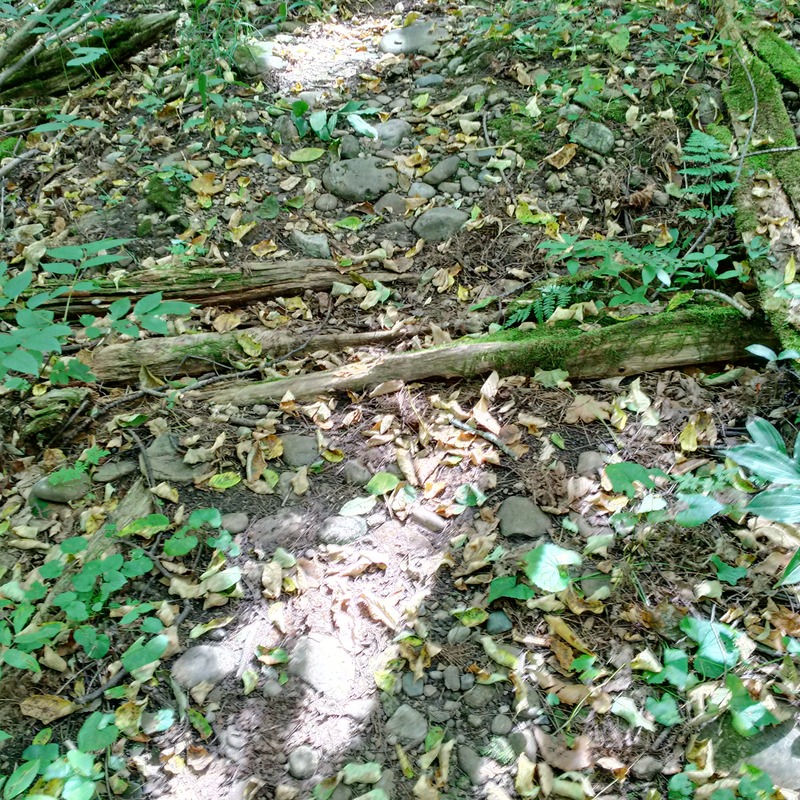 Along what is now known as Flume Trail you can still see traces of the wood from the open flume that carried the water from Trout Hollow lake to the power generating station. 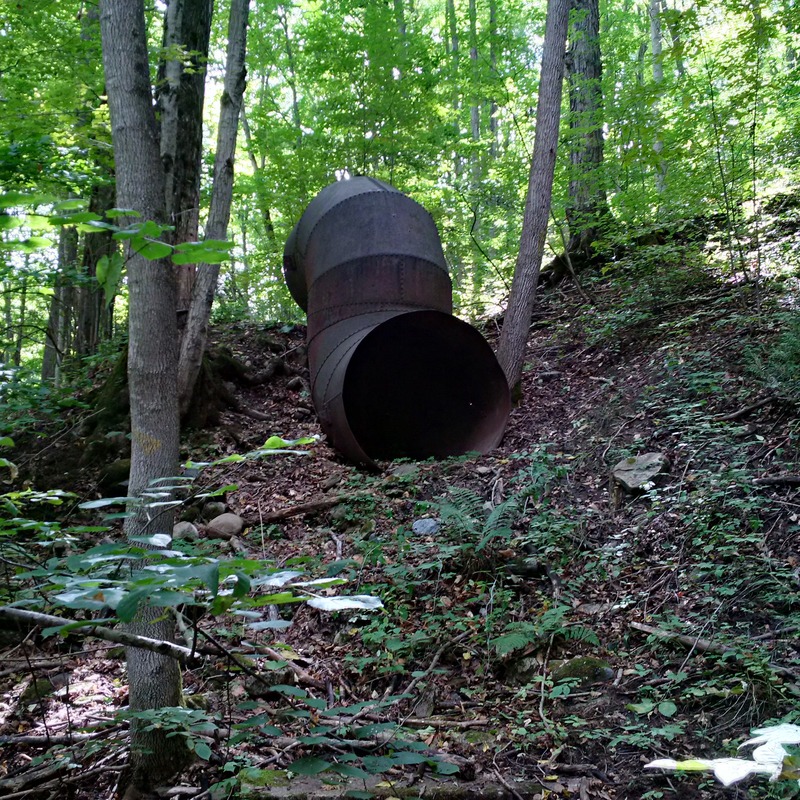 The metal down tube remains on the side of the hill where it was once connected to the wooden flume. 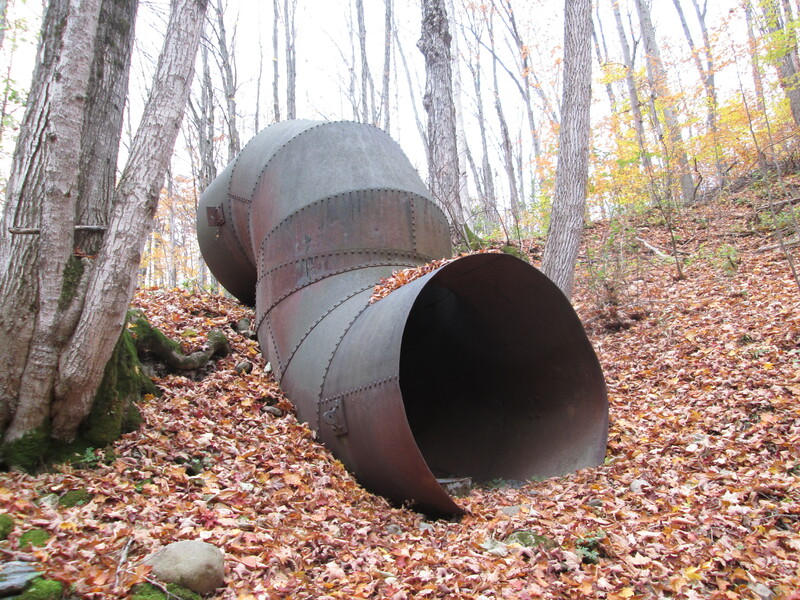 From here the water was dropped to the settling basin where the turbine wheel was located. The failure of the industries in Trout Hollow reminds us of the hardships faced by small businesses in the Victorian era. Lack of resources and capital often caused them to fail when the economy changed and they were frequently unable to recover from tragedies such as the fire in Trout Hollow. 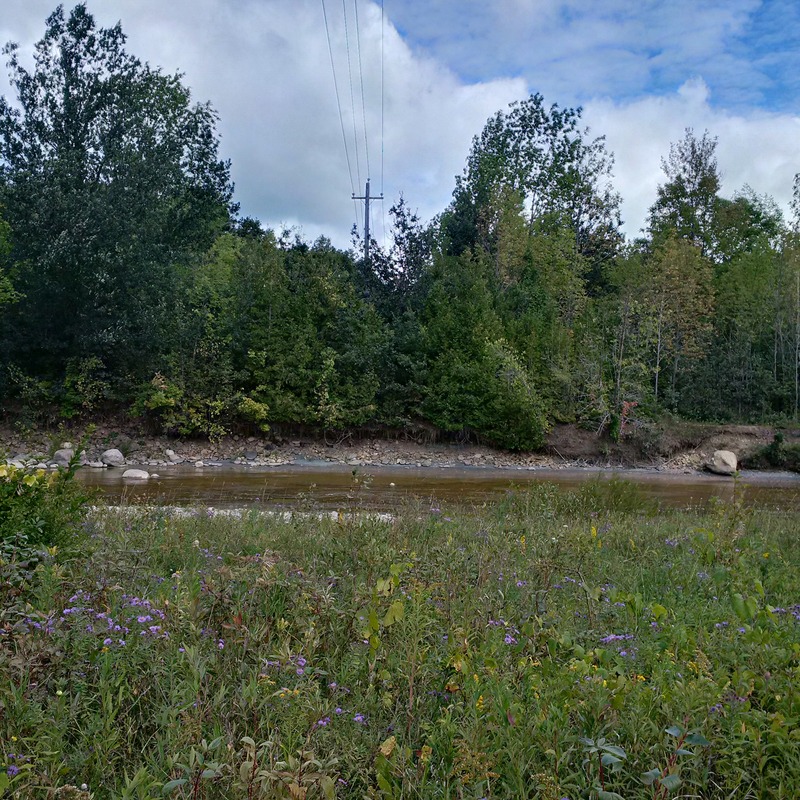 This entry was posted in Bighead River and tagged Bighead River, Georgian Bay Milling and Power Company, Meaford, Trout Hollow, Trout Hollow Trail, Trout Mills on September 16, 2015 by hikingthegta. One of my brothers celebrated a birthday this week and so I had the opportunity to visit him in Meaford on the weekend. This week’s hiking the GTA will have to refer to hiking the “Georgian Triangle Area”. We parked just outside of town on 13th sideroad just east of the 7th line. The sideroad ends here as it is no longer maintained down the side of the hill. It was one of those cloudy fall days where the sky looks like it is threatening to snow and the wind makes it feel much colder than the 9 degrees on the thermometer. 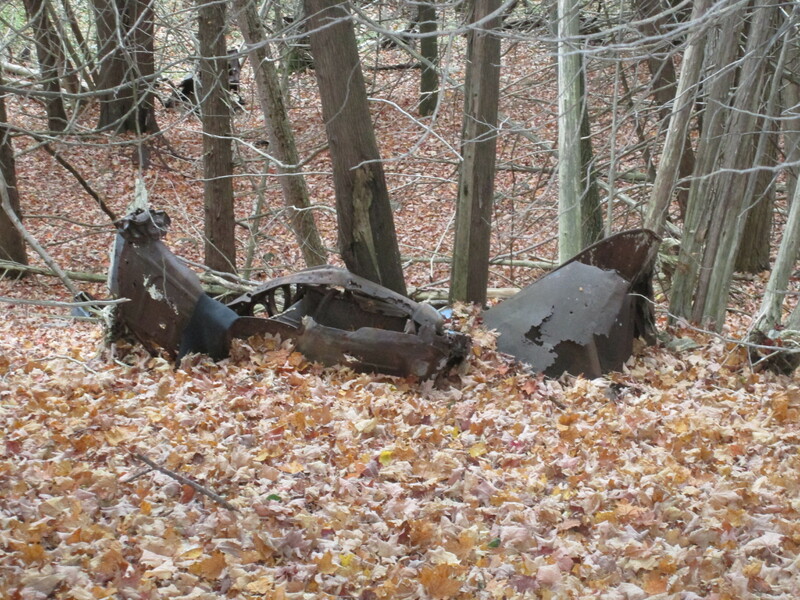 As we walked along the road allowance we started to find the remains of old cars. It’s hard to say how many cars are here because the parts are all mixed up. There could possibly be five of them, all from the late 1940’s or early 1950’s. 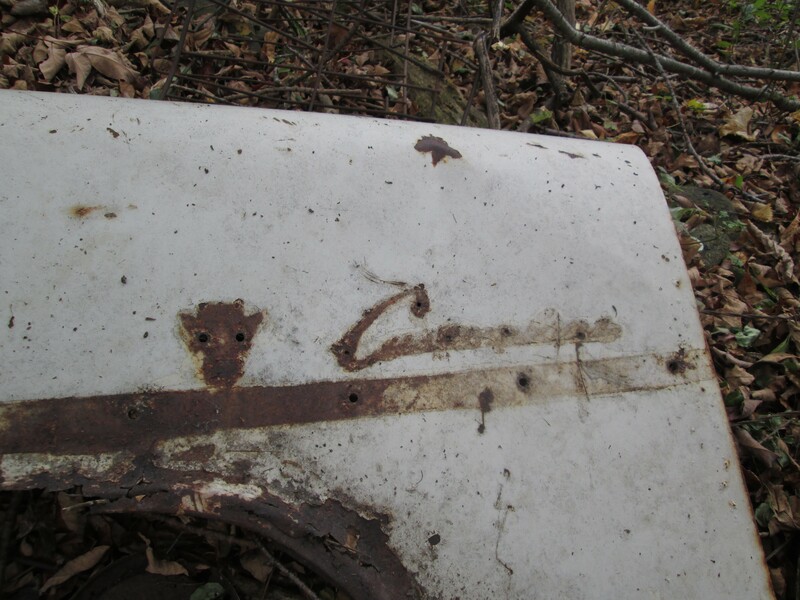 The first pile we found contained the hood of an old Ford truck, a panel with the three trademark vents of a Buick and the side panel of a Cadillac among various other parts. The Cadillac can be dated to 1947-1952 based on the shape of the logo. Cadillac has changed it’s logo many times over the history of the iconic vehicle. The logo from this era is the one on the right hand at the top. Two or three cars had been pushed down the side of the hill before the trees had grown on the embankment. This one was about 30 feet down and getting there on the slippery leaves was not an option. 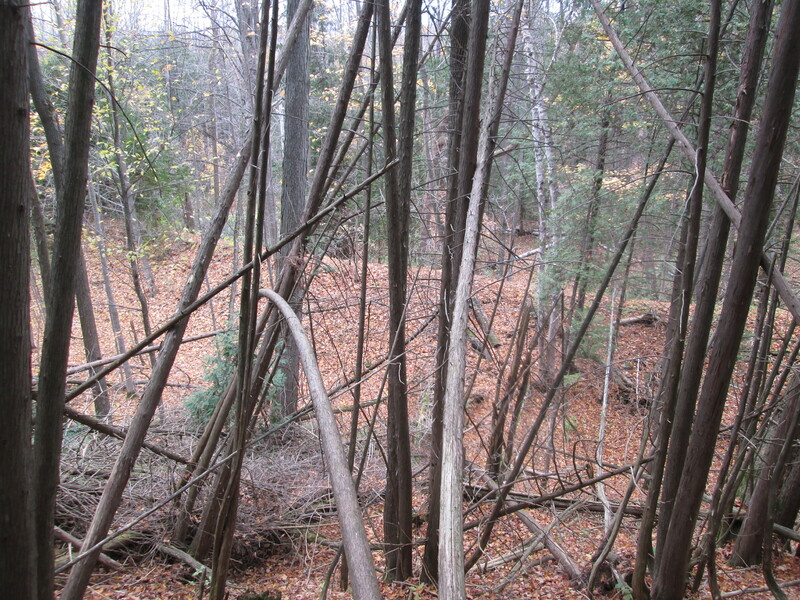 As we walked a little further along we found a side trail along a high berm of earth. From up there we could see a straight line running through the trees like an old roadway. It can be seen as the light coloured line running across the middle of the picture below. This line turned out to be a forty foot wall of rocks running toward the berm of earth we were standing on. Near the point where the two met we found the remains of two concrete sluice gates. The earthen berm we were standing on was part of an old dam. The rock wall was actually an aquaduct that carried an open wooden channel on top. The channel originated in a cut-out on the side of the old earthen dam. Along the top of the aquaduct there are still a few wooden rails that once formed the channel that carried water from the pond to the powerhouse. As seen in the picture below, the mill pond behind the sluice gates has become overgrown with trees. Returning to the stone aquaduct we followed it back through the woods. 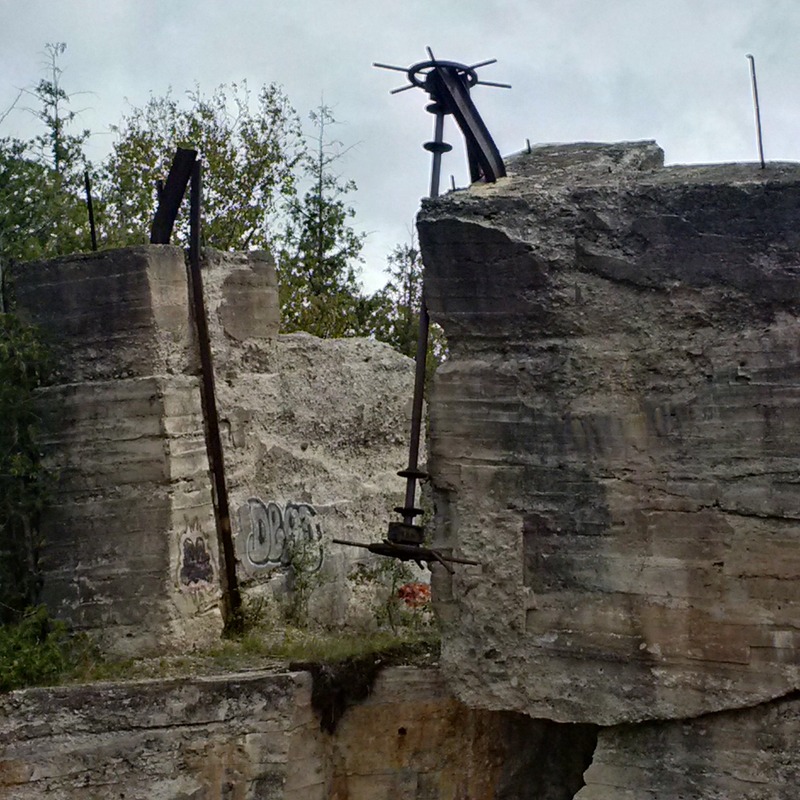 It brought us to the site of the 1902 power generating station for the town of Meaford. At the turn of the last century electrical power was slowly coming to communities all across Ontario. 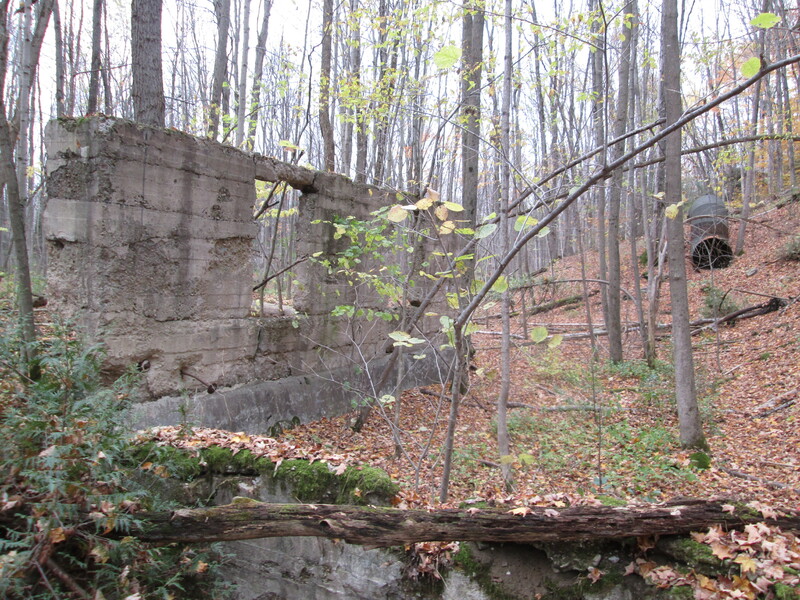 The Georgian Bay Milling and Power Company built a generating station in an area known as Trout Hollow. Trout Hollow was an industrial complex in the 1800’s with several mills and a cabin already in existence. The power company built the aquaduct to carry water to the power generating station. Just before the powerhouse a five foot diameter steel down elbow remains on the side of the hill. From it the water was dropped onto the turbine that generated the electricity. Georgian Bay Milling and Power Company was granted a contract to provide street lighting in Meaford between 1905 and 1913 but no agreement was made for private homes. An analysis was also made as to the amount of coal each of Meaford’s industries was burning per month in their steam generators. The power company planned to supply electricity to each of them as well. In the early 1920’s government grants were made to Ontario Hydro to develop electrification of rural areas. Unable to compete with the artificially lower rates, most private electricity producers went out of business before the end of the decade. This facility was closed in 1923. Today, most of the walls have fallen over with just one remaining upright. It is leaning a few degrees to the outside and may not stand too much longer itself. In the picture below the steel elbow can be seen in the background. At the bottom of the picture, in front of the remaining wall is a settling basin. Brantford Plow Works was founded in 1877 by James G. Cockshutt. In 1882 it became known as the Cockshutt Plow Company and it went on to become one of the largest farm implement manufacturers in Ontario. After being bought out in 1962 by White Farm Equipment the name Cockshutt was retired. An old harvester “Cockshutt 3” has been pushed down the hill not too far from the old powerhouse. It has been here long enough that a tree has grown around some of the metal frame. By the early 1900’s the manufacturing plant for Cockshutt had turned into a major industrial complex offering a full line of farm equipment. In 1941 they invented a lighter version of the swather that allowed the farmer to cut hay on wet fields that heavier equipment would get stuck on. This gave them a command of the market that led to a further expansion. A 1910 diagram of the plant illustrates the size of the complex. Note the smoke stack in the middle which shows that they had their own coal fired steam generator to produce electricity. 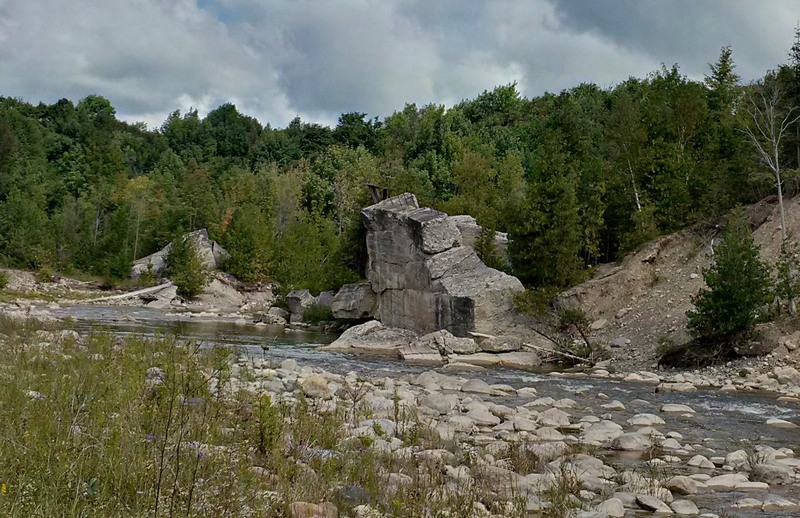 This entry was posted in Bighead River and tagged 1947 Cadillac, Cockshutt, Georgian Bay Milling and Power Company, Meaford, Power Generation on October 29, 2014 by hikingthegta.